A selection list is a vertical list, typically containing text labels. One or more items in the list get visually picked by clicking on them, or by using the keyboard. 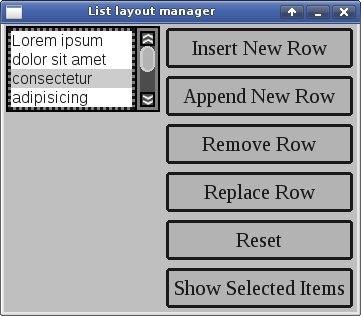 The list layout manager gives an initial impression of a simple, basic layout manager. All it seems to do is show a vertical list of text labels, but it's versatility becomes more apparent when it gets used to underpin hierarchical lists, menus, combo-boxes, and tables. // isn't critical for this example. // The first column in the window contains the list container. // container is going to span the six rows in the first column. // parameter, if it wants it), or any of its parent display elements. std::cout << (info.selected ? "highlighted"
// Initialize the contents of the list container. // custom colors or fonts, for the given item. // rows requested in the new_listlayoutmanager. // all the four buttons end up in the second column. // button would, by default be just wide enough for its label. // they cannot capture references to their parent display elements. // an IN_THREAD parameter update the list item. // of the display element. // list items until the connection thread processes the message. // other execution threads from accessing the list. // it in the x::w::list_item_param. // new list items that get created here. std::cout << "Item factory: "
// a std::vector of list_item_param-s as parameters. // std::string (UTF-8) or std::u32string (unicode). // A plain const char pointer will work as well. // that the existing item gets removed. // all items from the list, then append_items(). // This effectively sets the new list of items. // thread modifies the list. << i << " is selected." A factory's create_focusable_container() creates a container that processes focusable events. The first parameter to create_focusable_container() is a creator lambda. Passing an x::w::new_listlayoutmanager for the second parameter creates a “selection list”. The newly-created x::w::focusable_container's get_layoutmanager() returns an x::w::listlayoutmanager. The selection list consists of rows of items. The selection list automatically sizes itself to be wide enough to show its widest item (this is the default behavior). The selection list's default height is four rows. “height(6)” sets the list's height to six rows. The selection list provides a vertical scrollbar for scrolling the list vertically when the selection list has more items than its set number of rows. listlayoutmanager.C's --rows option sets the number of rows in the shown list. This example sets the list's minimum height to four rows and maximum height to 10. The list's height starts to grow after four items, and stops growing and starts scrolling after ten. The list's height gets computed based on the list items' default font's height and the number of rows in the list. The list's height does not come up to be an even number of rows if the list contains separators or items with custom fonts. An item in a list gets selected by clicking on it, or by tabbing to the selection list, pressing Cursor-Down to highlight the first item in the list, then using Cursor-Down and Cursor-Up to highlight the list item, and Enter to select it. The default list style changes the background color of selected list items. Setting x::w::new_listlayoutmanager's constructor's optional parameter to x::w::bulleted_list reserves some room to the left of each item, and draws a bullet there next to each item when it's selected. listlayoutmanager.C's --bullets option does that.